In its conference call today, Apple's chief executive Tim Cook outlined an expansion of its "Apple at Work" initiatives, intended to help enterprise Information Technology workers to more efficiently procure, manage and deploy Macs and iOS devices for their workers. CDW, Apple's initial launch partner, has been selling education, business and government agencies technology products and services for 34 years. 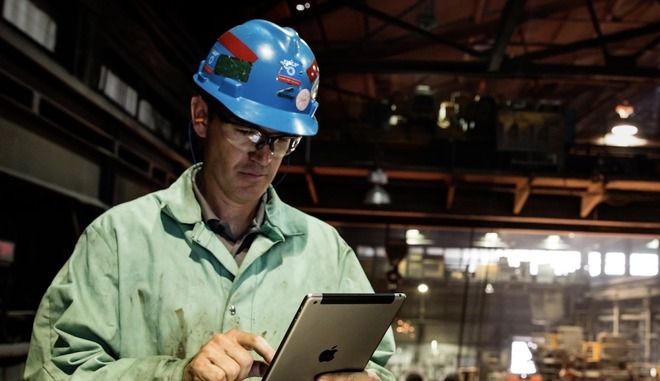 By working with CDW as a partner, Apple can focus on making great products while benefitting from the experience of a well-known vendor to support and facilitate sales relationships with enterprise buyers. Apple publicly launched its first big iOS enterprise partnership with IBM in 2014. Last summer, IBM's General Manager of Offerings and Solutions Mahmoud Naghshineh stated in an interview that "Apple devices are already pervasive in the enterprise." He added, "we're delivering innovative apps, securely integrated with a company's enterprise data, taking advantage of the Apple user experience to change the professionals mobile experience," noting that IBM now has a team of 10,000 designers and developers working to assist enterprise users to create custom iOS apps, working out of centers in Shanghai, Bangalore and Bucharest. The company recently refreshed its Apple at Work website, which outlines for business professions why they should consider Macs and iOS devices. The site cites Apple's partnerships with IBM in building over 100 custom enterprise apps driven by big data analytics, as well as SAP and its iOS integration with its business process tools, Deloitte's dedicated team of 5,000 Apple-specific consultants, an iOS-specialized practice run by Accenture, GE's support for iOS industrial apps using the Predix SDK and Apple's work with Cisco to optimize the performance of iOS and Mac apps on its networks. The site also details success stories with iOS clients including Australia's Queensland Police, British Airways, Capital One bank, Japan's Tokyo Metro operations, SKF manufacturing and Schindler maintenance technicians. The company also provides a white paper focusing on Employee Choice for IT, detailing a Jamf Employee Choice survey that highlighted when given the choice, about 3 out of 4 employees picked Apple for use at work. It also cites a Gensler Workplace Study that indicated that "employees with choice can have a notable impact on their individual levels of innovation, job performance, and job satisfaction."